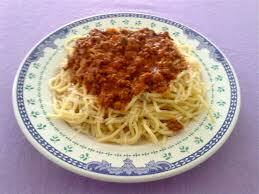 Last Thursday I made spaghetti for dinner. It turned out to be an inspired decision, but at the time I was just trying to do something with the two pounds of cooked hamburger meat that had been sitting in the fridge for several days. Exactly how many days I can’t say, but I’m using the word several in its highly elastic sense. It was long enough, at least, that I was close to losing my nerve and throwing away $7.32 worth of 80/20. I also had a veritable heap of pasta left over from dinner the night before, which is why spaghetti was the obvious choice. I don’t do all my menu planning this way, but when you can kill two birds with one stone, you should do it, right? Anyway, I thought if I made a meat sauce from scratch to put over the noodles, maybe no one would notice that we were eating old hamburger mixed with old pasta. So I found a recipe online for a homemade spaghetti sauce whose ingredient list matched what I was fairly confident we already had in the house. Many times I will come up against a recipe I would love to try, but then discover we’re missing a key ingredient or two. In these situations, there are a few things I can do: make forced substitutions, or order pizza. This is why, in our house, when we’re not eating pizza, chicken parmesan is sometimes made with canned tuna. The option that is unequivocally not on the table is to make a special trip to the grocery store for that one missing ingredient. Oh, no, not on my watch. I’m a man, dammit, and we can make do with what we’ve got on hand. As with most men, I pride myself on my resourcefulness. In fact, resourceful is my middle name. Well, actually it’s Jon, but that just shows how resourceful my dad was: he found a way to give me that name using only 75% of the necessary letters. After several minutes spent trying to memorize the recipe off the computer screen, I concluded that it would be easier, and quicker, to just run back and forth between the kitchen and my desk as many times as necessary. I focused only on the first step, which was to cut up one medium-sized onion, and four cloves of garlic. For some reason it’s always the little ambiguities that get me when I cook. I know what an onion is. But do I really know exactly what constitutes a medium-sized onion? How big, exactly, is medium? I lined up my three suspects on the counter, and pondered each carefully. Yes, they were definitely onions. And they were all almost identical in size. But were they all medium, or were they all something else? I was already at a definite disadvantage working with old hamburger and pasta; I didn’t want to compound my problems by over-onioning or under-onioning the sauce. I stared them down, hoping one of them would crack and spill the scallions. After several long moments, I realized that my youngest daughter was watching me, so I pretended to be examining the onions very carefully for blemishes. After the kid wandered off, I selected the most average-looking one, and then, so I wouldn’t be tempted to second-guess myself, hid the other two in a nearby cookie jar. I peeled off the onion’s papery skin and placed it on the cutting board. I began to dice it the way I’ve seen Alton Brown do on those Food Network shows. Halfway through, though, I realized that I had lost the trick of it (as if I’d ever had it), because my onion was looking as mangled as if it had been set upon by an angry pack of hamsters. To finish the job I had to resort to my more primitive approach of random, frenzied chopping. I ended up with a pile of onion pieces that ran the gamut from the size of a grain of rice to slices that looked more like the toenail clippings of a rhinoceros. The garlic was easier, if only because the small, slippery nature of those peeled cloves demanded close attention. I didn’t dare try to cut them with the same kind of dazzling speed displayed by the experts on TV; I’d be down three fingers before I knew what had happened. And that, of course, would create more work as I would have to separate the finger bits from the garlic bits before proceeding with the recipe. No, sir. Slow and steady is the name of the game when it comes to dicing garlic. I finished chopping and scraped the onion and garlic into a pan, and turned on the burner. Most people would have turned the burner on first, to let the pan heat up while they cut, and I would have too, but I somehow forgot until the last moment that a pan was necessary for making meat sauce. In my defense, though, the recipe never mentioned a pan*. For all I knew, this could have been one of those cook-directly-on-the-burner recipes that are all the rage in Parisian couture cuisine these days. * Actually, it did. I guess I somehow missed it in all the running back and forth between the kitchen and the computer. About five minutes later, it hit me that I had failed to add some olive oil to the pan with the onions and the garlic. Glad to have remembered before it was too late, I poured a little into the pan and then ducked quickly as the oil spewed up in a small, superheated geyser. I immediately made a mental note not to do that again, and by that, I mean ducking. While it was reassuring to know the ol’ reflexes were as sharp as ever, that comfort was short-lived and quickly replaced by the knowledge that hot oil is still really hot, even when it has to fall a few extra feet to hit you. It would have been better to jump back instead, or maybe just eliminate the problem altogether by wearing welder’s gear. By now, an experienced cook surely would have pushed me out of the way and assumed control, exiling me from the kitchen for my failure to follow certain basic procedures. But cooking for me is an amateur sport, thrust upon me by necessity without any kind of formal training. To compensate, I have invented my own style of cooking. I call it cooking by intuition. The nice part about cooking by intuition is that is simplifies such annoying trivialities like cooking time, and temperature. The bad part is that you never really know if dinner’s going to turn out okay, even if it’s something you’ve made two dozen times before. There’s always that element of unpredictability, because you can never remember exactly what you did last time with the grilled salmon, when it turned out to be so succulent, or what you didn’t do that caused the chicken to come out pinker than the salmon. Taking notes, or making any sort of effort to retain crucial information really, would directly violate the spirit of cooking by intuition. And besides, what’s life without the risk of an occasional bout of botulism anyway? I let the onion and the garlic sizzle in the pan for something like seven to ten minutes (time in the intuitive kitchen is not to be measured precisely), then I mixed in the pre-cooked ground beef. I let the meat warm up for awhile in the garlic and onion mixture because I intuited that to be a good idea. And when the time felt right, I added the tomato sauce, a can of diced tomatoes, and the various spices and seasonings. Then I stirred it all together. I had to do this carefully because by now the pan was almost completely full (I guess that’s why it’s usually called a pot of spaghetti, not a pan of spaghetti), and each sweep of the spoon threatened to send a small meat sauce tsunami over the side. It took all of three minutes to heat up the leftover pasta in the microwave, and then dinner was served. No French bread, no salad, no candles plugged into wine bottles. If I’m cooking, and I say we’re having spaghetti, that’s exactly what I mean. Spaghetti. A one-course meal. No one starves. Mission accomplished. Now, if you were sitting down to eat the result of what I’ve just described, your expectations probably wouldn’t be very high, would they? Come on, it’s okay, you can admit it. You’re not going to hurt my feelings. To spare my feelings, you might tell me your tummy was a little off, excuse yourself, and spend the next hour in the bathroom just to make it look convincing. Then, around eight-thirty, I’d catch you in the pantry, huddled in the dark, quietly nibbling on a saltine. I know. In reading over what I did to that poor meat sauce, I would’ve done the same thing. intended) provided by the fork. But you know what? None of the poor, famished souls who sat down at that table knew about all the mistakes I made in preparing dinner. The spaghetti was well-received by everyone, even the youngster, who’s three, and usually won’t eat anything that’s not either a chicken nugget, a hot dog or a refried bean. And actually, I’m being modest. They loved the spaghetti. They raved about it. 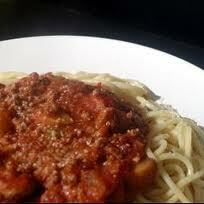 They sang the praises of the rich, savory meat sauce all through dinner. Oldest daughter told me I need to open my own restaurant, which I spontaneously, though uninspiringly, named “Dad’s”, and wife said she wants this added to the ‘regular rotation.’ The youngster eats nearly half of what she was served, which is the highest praise of all, since she normally refers to pasta, any shape or form of pasta, as ‘poopy pasta,’ and refuses to touch it. Even I, who have been behind the curtain the whole time, and witnessed first-hand the horrors that I perpetrated on this innocent, unsuspecting dinner, agree: it’s pretty good. In our family, we all prefer savory to sweet when it comes to spaghetti sauce, and this has that meaty, well-seasoned flavor that is just a little on the salty side. Three days later, we’re all still eating the leftovers, and talking up the spaghetti, and saying how it might even be better now than it was the first night (yes, that’s right, the hamburger is now three days older). Now, I’m not sure what the message in all this is. I’ve spent a lot of time thinking about it, because it is my wont to find lessons in all the strange little things that happen in my life. By all rights, dinner should have been a complete flop, if not a communal exercise in projectile vomiting. Somehow, the old hamburger, day-old pasta, the violations of protocol and the deviations from the recipe all conspired to create a masterpiece. How did that happen? More importantly, why? Maybe the message is a hopeful one. Maybe it means that sometimes you can screw up just about everything, and still end up with something good, great even. Maybe it means there’s a future for the new culinary art of cooking by intuition. Or maybe it just means it’s really, really hard to mess up homemade spaghetti sauce. Whatever the reason, I invite you to try it sometime. See for yourself. Follow as much or as little of the following recipe as you like. If you don’t want to let your cooked hamburger age in the fridge for the better part of a week, don’t. If you want to use a pot instead of a pan, be my guest. I just hope that whatever you do, you end up with a good batch of spaghetti sauce. 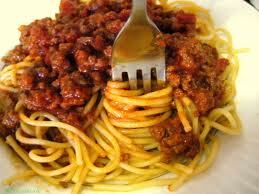 A good spaghetti dinner can be a salve to the spirit, and a balm to the soul. And remember, like my mom always says, “Enough garlic can cover up a host of sins, except bad breath.” And that’s coming from a woman without a single drop of Italian blood. 3 tsp. Italian seasoning (the recipe called for just oregano and basil, but I didn’t have any oregano, so I used McCormick Tuscan-style Italian Seasoning, which has both but also includes other spices like thyme, marjoram, sage, and rosemary (blech!). I wish I could have tried it with just the oregano and basil, but of course that would have meant a special trip to the store, and it should be clear by now that I cater to no recipe). 1 Dice the onion to the best of your ability, and then do the same for the garlic. 2 Find the biggest pan you can and place it on the burner. 4 Dump the diced onion and garlic into the pan. 6 Add a drizzle of olive oil to the pan. 9 Add your precooked beef and stir it into garlic/onion/olive oil mixture until thoroughly and harmoniously combined. 10 Let it cook a little more. 11 Add the tomato sauce, diced tomatoes, and spices. 12 Stir (If you’re still using a pan, stir very carefully. Having a good wet/dry vac handy (with attachments) wouldn’t hurt either). 13 Let simmer for at least twenty minutes. 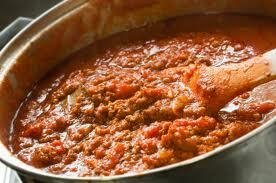 If what they say is true about spaghetti sauce getting better the longer it cooks, then continue at your own risk. I will not be held responsible for any damage done to your taste buds from too much deliciousness. P.S. 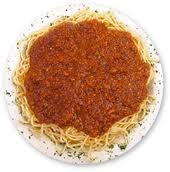 Here’s the link to the original recipe on allrecipes.com, imaginatively titled “Spaghetti Sauce with Beef,” which forms the basis for my creation. Who knows, you may like that one more.